The TABER® Webbing Abrasion Tester - Model 5820 is used to evaluate abrasion resistance properties of seat belts and other webbing products (e.g. safety straps, tie-downs, harnesses, helmet straps, etc). Common types of materials that can be tested with this instrument include nylon, polyester, leather, polymers, and other flexible sheet materials. A specimen clamp bar secures the specimen to the instrument while a specimen roller ensures an angle of 85° (±2°) is maintained between the specimen and hexagonal (hex) abrasion bar. Test specimen is weighted, and then subjected to a unidirectional reciprocal rubbing action as it travels back and forth over the hex abrasion bar. The test specimen passes over two of the six abrading edges of the 12" hex abrasion bar during each test. Depending on specimen width, up to three specimens can be evaluated simultaneously. 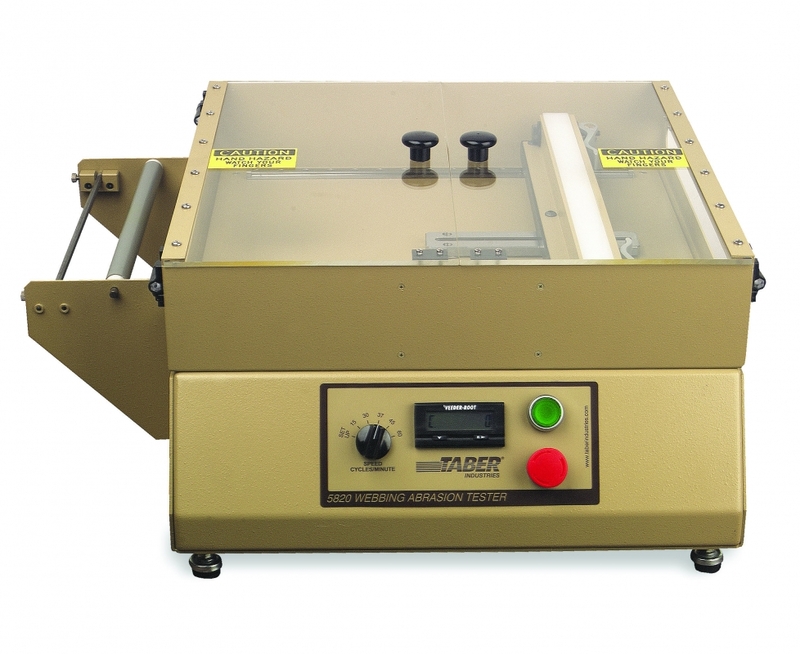 Other features of the Taber Webbing Abrasion Tester include a slotted roller channel allowing a maximum stroke length adjustment of 305mm (12 inch); five preset speeds including 15, 30, 37, 45, and 60 cycles per minute; hinged, transparent safety cover; and a standard weight set of 2, 4 & 5.2 lbs. (an optional weight set of 3 & 5 lbs. is also available). The Webbing Abrasion Tester has the capacity to test materials with a breaking strength over 13,500 N per ASTM D6770, MIL-W-23223B, US Department of Transportation FMCSA Part 571.209 and other internationally recognized test standards. Two (2) fresh edges of the abrasion bar should be used for each test. If only one specimen is being tested at a time, the next specimen can be abraded on a different part of the hex abrasion bar. Once the entire length of the bar has been utilized, it must be rotated to expose two (2) new edges. After the entire surface has been utilized the hex abrasion bar should be discarded and replaced. The most common evaluation technique for evaluating abrasion resistance of webbing material is to utilize a CRE-type tensile testing machine equipped with split-drum webbing clamps as described in Federal Test Method 191b, Method 4108. Average Breaking Strength - For each sample lot, the average breaking strength should be calculated for both the abraded (A) and unabraded (U) lots. The average breaking strength is found by summing each individual sample's breaking strength and then dividing by the total number of samples in the lot. 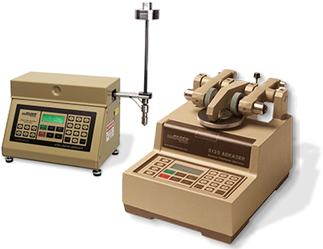 The following link provides a listing of test methods the Taber Webbing Abrasion Tester satisfies. Please note, additional accessories may be required.